Dairy farms are expanding and modernizing, processors and local artisans are creating new and unique products to meet the growing demand, and the quality and variety of North Carolina’s dairy industry is being widely recognized. With strengthening infrastructure of resources and networks, North Carolina is a leader in the Southeast in innovation as well as for milk production per cow. Along with a Dairy Advantage, North Carolina boasts some of the best environments for qualities of life anywhere in the country. From the mountains of Appalachia to the Coastal Plains along the Atlantic, many opportunities abound in North Carolina. North Carolina's agricultural industry, including food, fiber and forestry, contributes $78 billion to the state's economy, accounts for more than 17 percent of the state's income, and employs 16 percent of the work force. North Carolina is one of the most diversified agriculture states in the nation. The state's 52,200 farmers grow over 80 different commodities, utilizing 8.4 million of the state's 31 million acres to furnish consumers a dependable and affordable supply of food and fiber. From milk haulers to equipment dealers, processors to veterinarians, North Carolina’s dairy infrastructure is active and poised for growth. 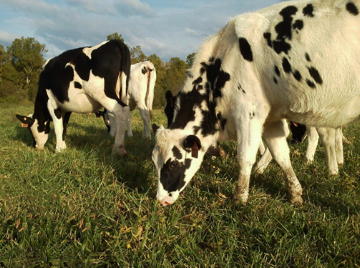 An abundant water supply and access to ample forage and feed resources, make North Carolina a sustainable area for dairy production. 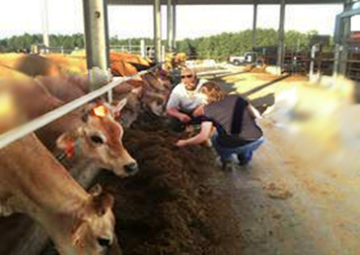 North Carolina dairy producers have trained business development specialists, an array of industry professionals, university professors, researchers and extension agents to turn to for answers and assistance. There are also small groups of dairy producers who have regular meetings to facilitate learning and trying out new opportunities. Mailbox prices for milk in North Carolina are among highest farm milk prices in the country. North Carolina dairy producers remain competitive by implementing economies of scale and various alternative production practices and strategies to maximize value and provide for a high quality of life. Whether you plan to milk 75 cows or 2,500 cows, North Carolina has many advantages in order to assist in making your dairy farm efficient, profitable, and successful. The extreme length from east to west is 503 miles. The total area of the State is 52,712 square miles, of which 49,142 square miles are land and 3,570 squares miles are water. The range of altitude is also the greatest of any state east of the Mississippi River, ranging from sea level along the Atlantic coast to 6,684 feet at the summit of Mount Mitchell, the highest peak in the eastern United States. The three principal physiographic divisions of the eastern United States are particularly well developed in North Carolina. From West to East, they are the Mountains, the Piedmont, and the Coastal Plain. 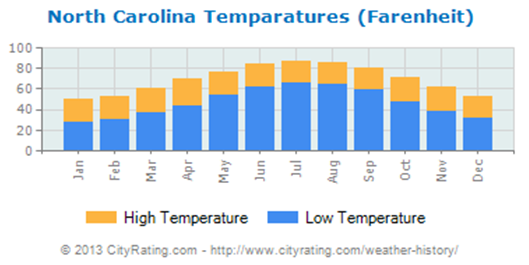 The most important single influence contributing to the variability of North Carolina climate is altitude. In all seasons of the year, the average temperature varies more than 20 degrees Fahrenheit from the lower coast to the highest elevations. Occasional invasions of cool dry air from the north continue during the summer, but their effect on temperatures is slight and of short duration. The increase in sunshine which follows usually brings temperatures back up quickly. When the dryness of the air is sufficient to keep cloudiness at a minimum for several days, temperatures may occasionally reach 100 F or higher in the interior at elevations below 1,500 feet. Ordinarily, however, summer cloudiness develops to limit the sun's heating while temperatures are still in the 90-degree range. An entire summer sometimes passes without a high of 100 F being recorded in the State. The average daily maximum reading in midsummer is below 90 F for most localities. 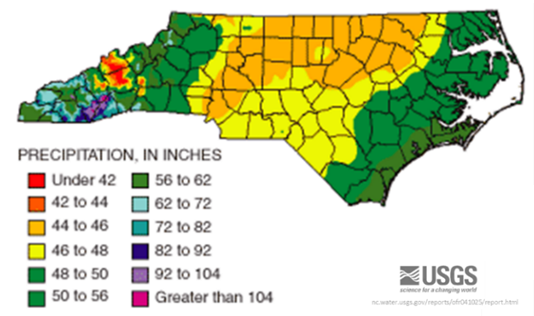 While there are no distinct wet and dry seasons in North Carolina, average rainfall does vary around the year. Summer precipitation is normally the greatest, and July is the wettest month. Summer rainfall is also the most variable, occurring mostly in connection with showers and thunderstorms. Daily showers are not uncommon, nor are periods of one to two weeks without rain. In southwestern North Carolina, where moist southerly winds are forced upward in passing over the mountain barrier, the annual average is more than 90 inches. This region is the rainiest in the eastern United States. Less than 50 miles to the north, in the valley of the French Broad River, sheltered by mountain ranges on all sides, is the driest point south of Virginia and east of the Mississippi River. Here the average annual precipitation is only 37 inches. East of the Mountains, average annual rainfall ranges mostly between 40 and 55 inches. The variety of climate in North Carolina produces a wide range of vegetation. The Piedmont is the center of population for the state, and is the major area for hay & cattle production. The range of opportunities for agriculture reflect this climatic and vegetation diversity. The average annual freeze-free period (growing season) lasts from about 130 days in the highest mountain areas to around 290 days on the Outer Banks. At Hatteras, entire seasons often pass without either frost or freezing temperature occurring and tropical fruits can be grown in sheltered spots. Cecil soils are the most extensive of the soils that have their type location in North Carolina. They occur on 1,601,740 acres in the State. They are estimated to be on nearly one-third of the Piedmont Plateau in the Eastern United States. The Cecil Series consist of very deep, well- drained, moderately permeable soils on upland ridges and side slopes. The average evapotranspiration measurement in inches for soils in Eastern NC is .13 inches. The average soil temperature and soil moisture in this area is 63.27 degrees F and .26 inches respectively. 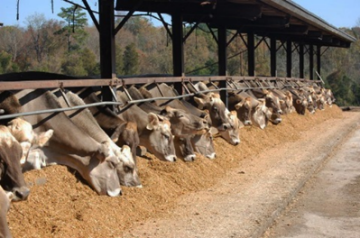 With significant grain and soil production along the Coastal Plain and Piedmont, North Carolina has relatively available sources of feed for dairy production. Feed mills dot the landscape and provide additional infrastructure support via technical and logistical resources. The varying topography makes it difficult to provide an overall average of water and soil quality. Generally though, water is abundant in the Coastal Plain and Piedmont regions with the Appalachia proving more difficult in sourcing and pumping. 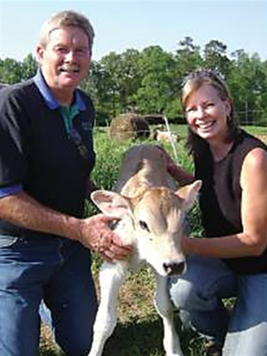 Piedmont Jerseys is owned and operated by Corey and Bridgette Lutz. The farm is located in Lincoln County, North Carolina. Both Corey and Bridgette grew up on dairy farms and started out on their own in 1997. They built a new facility on land purchased from Corey’s father. The Lutz’s currently milk around 230 registered Jerseys and sell about 60% of their heifers each year. They own 240 acres and rent an additional 200 acres. There are about 90 acres dedicated to intensive grazing for the milking herd with pastures that include Ryegrass, Matua, Orchardgrass, Alfalfa, and Sudex. All the cows are watered by 2 wells with over 4,000 feet of water lines. The RHA is 19,400lbs. Milk is contracted though Piedmont Milk Sales. The farm has 4 employees; 2 milkers, 1 calf and heifer feeder, and 1 crop manager. Corey and Bridgette are considering on-farm processing, expanding their business and continuing to improve their grazing strategies thus lowering production cost. Corey and Bridgette consider North Carolina and exceptional location for grazing dairies, due to the mild winters, well-draining land, and variety of grasses that can be grown. As a Jersey breed enthusiast and bottom- line hawk, Corey contends to North Carolina’s reputation for high quality breeding and financial management that’s made many here successful. Corey also serves on the Board of Directors of the American Jersey Cattle Association. Zach and Sybil Myers- Myers Dairy, Inc.
Zach and Sybil Myers are the owner/operators of Myers Dairy, Inc., in conjunction with Zach’s parents, Dwayne and Barbra. Myers Dairy started with 12 cows in 1948, today, Zach is a third generation dairy farmer, managing approximately 840 cows with 700 replacements. 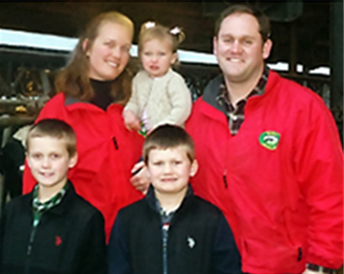 Zach graduated from NC State with a biology degree and from Michigan State with a Masters in Dairy Cattle Nutrition in 2003. Sybil has a degree in biology from NC State and while she was not raised on a farm, her experience and education serves her well as manager of the on-farm milk culture lab and calf operation. Myers Farm, Inc. has a RHA of 26,000lb on a three times a day milking and markets milk through Maryland & Virginia Milk Producers. Heifers are raised on farm to 600lbs, then sent to a custom grower and return 60 days prior to calving. There are 15 full time employees, as well as three part time. The lactating cows are housed in freestalls with headlocks while dry cows are housed in a pack barn. 500 acres of corn and 200 acres of small grains are custom harvested. 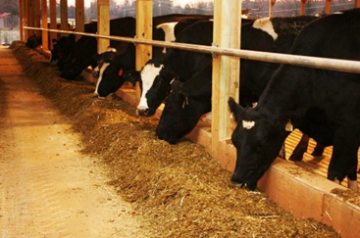 Other feed commodities include; DDG, Citrus pulp, ground corn, soybean meal, cotton seed hulls, molasses, wheat straw, custom protein mix and a custom mineral mix. Zach plans to lease or purchase another dairy and expand his operations to 2500 cows. According to Zach, “There is tremendous potential in North Carolina for dairies. We are milk deficient in a fluid market and as a result we have a good pay prices. The milk climate and an average year rainfall provides for good forage production (tonnage and quality) without irrigation. Myers Dairy, Inc. is located in Jonesville, NC at the foothills of the Appalachian Mountains. Brush Creek Swiss Farms is a family owned and operated registered Brown Swiss herd located in Central (Piedmont) Region of North Carolina. 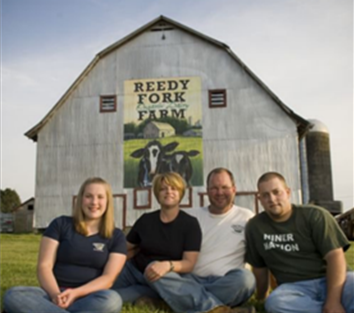 Norman Jordan, Jr., along with his wife Karen, Jordan and parents, Norman and Beverly, operate this third generation dairy farm. After receiving a Bachelors of Science in Animal Technology, Norman Jr. returned to take over management of the herd. Current rolling herd average on 75 cows is about 21,500 lbs. Milk is marketed through Dairy Farmers of America. The herd is housed in a freestall barn, with turn out into lounging paddocks whenever the weather permits. The ration is a corn silage based TMR with intensive supplemental grazing during spring and summer using Ryegrass followed by Sudex. The farm grows all of its corn silage, hay and straw and uses a commodity shed to store ground corn, soybeans and cottonseed hulls. A local feed mill mixes citrus pulp, whole cottonseed, bypass protein product, vitamins and minerals. All heifers are home raised, starting out in hutches, moving to super hutches, then to pasture. 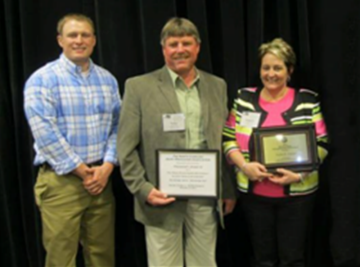 In addition to dairy farming, Norman is the president of the North Carolina Dairy Producers Association and Karen is a large animal veterinarian. According to the Jordan’s, “NC has ample opportunities for fairy youth to participate in judging, showing and other activities. Also, we are in a very rural location, but within one hour we can be in a major city and in three hours we can be at the mountains or at the coast. NC is a great place to dairy, raise a family and live.